paskewich.com: Sunni & Shitte: What's the difference? Sunni & Shitte: What's the difference? Muslims are Muslims right? It’s not that easy. A few years ago I had the privilege of taking a week-long class on the Koran taught by Muslims. Honestly, my head was spinning most of the time, but I finally began to figure some of it out. Not all Muslims are the same. Both believe in the Koran. In Iraq leaders like al-Sadr (whose father Sadr City in Bagdad is named after) is Shiite. Hezbollah (meaning Party of God) who is engaged in the struggle with Israel on the Lebanese border is Shiite..
Al-Qaeda is Sunni. Osama bin Laden is Sunni. Saudi Arabia is Sunni. Iran is Shiite. Both the Shiites and the Sunnis are committed to the worldwide spread of Islam, meaning all nations everywhere would be subject to Islamic Law. Both the Sunnis and the Shiites are against Israel and want to see Israel destroyed. 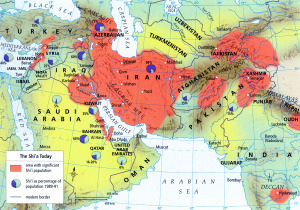 The Sunnis (Iraq) and the Shiites (Iran) were involved in a decade long war against each other in the 1980’s. Iraq, under Saddam Hussein, which was predominantly Sunni fought Iran, under the ayatollahs which were Shiite. Muslims against Muslims, but Sunnis against Shiites is the way they viewed it. There really was never any clear victor in that war and some say there were upwards to one million deaths. These scars are still very much present in the region today. Today, July 2006, those fighting against Israel in southern Lebanon are the Shiites, known in this context as Hezbollah. So, what happened to make them enemies? It wasn’t their common beginning, but it happened after Muhammad died. There was a struggle for succession. Who would be the leader of Islam. There were two groups, each believing they were the ones following what Muhammad desired. The Sunni faction believed that some kind of ‘election’ or group consensus by Muslim leaders or elders were supposed to pick the right person to lead Islam into the next phase. Muhammad’s father-in-law, Abu Bakr, came out the winner. That was in 632 AD and they have been fighting ever since with varying intensity through the ages. One of the most famous battles happened after Muhammad’s death. Once a year this event is remembered by Shiite Muslims who cut their heads in remembrance. Unbelievable really. Pretty gross as the picture shows. I don't know, is it just me, or does hitting your head a few times with a sword not sound like any fun. And then hitting your kid's head with a sword? What's the point of all that? Sunnis are the largest group of Muslims, with the Shiites mostly concentrated in a smaller region. Iran, Syria and parts of Lebanon. Although they are the smaller group, they are strategically located to cause Israel and the world an awful lot of trouble. The map shows the primary locations of Shiites. The groups have little in common, outside of their hatred for Israel. And, oh yea, they for the most part have no great love for the United States either. Thank you for posting this. I have always wonder what the difference was. I have a persian friend but was always too afraid to ask because I didn't want to offend him. The media is always talking about the sunnis and the shites but all manages to neglect to tell why there against eachother. As, I was reading this though I truthfully wondered if there was a right side to agree with. Do you personally have a side that you side with? Thanks again for posting this God bless you! Thanks for educating me on this, and no, the sword-head-hitting thing doesn't sound like much fun. Do you suppose they pass around Tylenol during these shin-digs? Abu Bakr did eventually become a "father-in-law" to Mohammed, but first he was simply a close friend and neighbor. Abu Bakr was one of the first to accept Islam, and did much to spread the word to others living in the area. It was after all this that he married his daughter to Mohammed. Ali was not only Mohammed's cousin, but also his son-in-law, marrying Mohammed's daughter Fatimah. And so, the Shi'ite's position not only relies on Mohammed's reported expressed will, as you correctly identified, but also (albeit less so) on a family inheritance basis. You picked especially bloody pictures to illustrate Ashura, the day on which many Shi'ites commemorate the martyrdom of Mohammed's grandson, Husayn Ibn Ali. The practice of head-cutting is an extension of the practice of "chest beating" that some Mulsim men take part in on this day(self-flagellation wasn't only used by Catholics, though this is usually relatively minor in comparison), and is fairly uncommon and plenty controversial amongst the Muslim community, and has been outright banned by multiple religious authorities. Parents involving their children is also extremely rare. Most Shi'ites spend the day participating in much more standard forms of remembrance, including the recitation of poems and stories concerning Husayn, ceremonial community meals at the Mosque, and even passion plays. Not all Muslims hate Israel. Not all Muslims hate the United States. Not all Muslims are committed to putting the world under the jurisdiction of Islamic law, and certainly it's only an extremely tiny minority who is in favor of doing this by violent means. However, it is true that Shi'ites and Sunnis are more or less equally likely or unlikely to hold such positions. 1. Abu Bakr did not elect him self after Muhammed's death. He voted for Umar ib AlKhattab and Abu Obayda. 2. Ali ib Abi Taleb voted for Abu Bakr to be the successor of Muhammed (PBUH). 3. Shittes says that when you kill a Sunni you will get rewarded by God !! 4. Shittes bellive that Ahlulbait (Muhammed, Ali, Fatimah and their sons and grandsons) have some kind of superpowers. eg. : knowing the future, controlling the weather, flying, bringing dead people to life ... etc. While we "Sunnis" bellive that they are normal people just like you and me. 5. Shittes bellive that most of "Alsahaba" who are Muhammed's friends, are liars and killers of Ahlulbait and they only wanted to be the successors of Muhammed for the power. That's why they hate most of Alsahaba. Sunnis on the other hand, bellive that they were close and there was a good relationship between them. eg. : most of Alsahaba were married from Ahlulbait. Plus, Ali named 3 of his children after 3 of Muhammed's best friends "Abu Bakr, Umar and Uthman". 6. We don't hate the USA as we have lots of American friends. However, maybe some of the old people hates them.